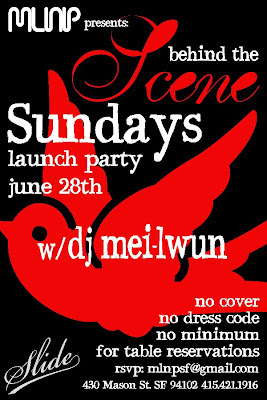 We are so very pleased to announce behind the "SCENE" Sundays starting June 28th @ Slide. Join MLNP for a casual take on San Francisco's finest venue and kick it behind the scenes. Think old school Hollywood studio stars, straw fedora and plenty of swagger. No Dress code, No Cover and No minimum for table reservation. Email MLNPSF@GMAIL.COM for your free reservation now!